I stepped on top of the waist-high rock and with some effort pressed upward. It felt like my leg was going to blow apart at the seams. We were hiking up a steep section of Strawberry Peak, and were about a mile from the summit. I’d done Strawberry from Red Box innumerable times, but my legs had never felt like this. Trail runners — and all of us that love the outdoors — are very good at finding ways to spend a little extra time outside. The first half of the day Skye and I had done the Bear Canyon loop and now we were climbing Strawberry Peak. 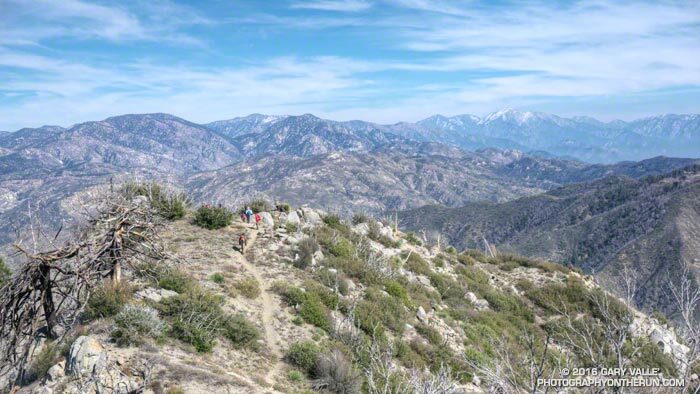 On its own the Red Box – Bear Canyon – Gabrielino loop is a demanding run. Because the canyon has been subject to numerous flash floods the Bear Creek Trail is a mix of classic mountain trail and segments of “use trail” through washouts and flood debris. Add in the elevation gain going from Red Box to Mt. Disappointment and from Switzer Falls back up to Red Box and you’ve got an adventurous run. About halfway through the canyon is Bear Canyon Trail Camp. Perched on a bench above the creek this idyllic camp was spared by the 2009 Station Fire. Because of the camp’s popularity the section of trail between Bear Camp and Arroyo Seco sees the most use and generally is in better condition than the section between Tom Sloan Saddle and Bear Camp. The 16 mile loop we did today is the shortest that goes through Bear Canyon. The loop can be extended by linking in the Valley Forge Trail or circuit around Strawberry Peak, or doing what we did today — the out and back to the summit of Strawberry Peak.